Chlodio (d. approx. 450) also Clodio, Clodius, Clodion, Cloio or Chlogio, was a king of the Franks who attacked and apparently then held Roman-inhabited lands and cities in the Silva Carbonaria and as far south as the river Somme, apparently starting from a Frankish base which was also technically within the Roman empire. He is known from very few records, but it is thought that he might be an ancestor of the Merovingian dynasty, and possibly a descendant of the Salian Franks reported by Roman sources in the 4th century. It is commonly said that the Franks came originally from Pannonia and first colonized the banks of the Rhine. Then they crossed the river, marched through Thuringia, and set up in each country district and each city long-haired kings chosen from the foremost and most noble family of their race. [...] They also say that Clodio, a man of high birth and marked ability among his people, was King of the Franks and that he lived in the castle of Duisberg in Thuringian territory. In those parts, that is towards the south, the Romans occupied the territory as far as the River Loire. [...] Clodio sent spies to the town of Cambrai. When they discovered all that they needed to know, he himself followed and crushed the Romans and captured the town. He lived there only a short time and then occupied the country up to the Somme. Some say that Merovech, the father of Childeric, was descended from Clodio. According to this account, he held power in the northernmost part of still-Romanized Northern Gaul, together with an area further northeast apparently already Frankish. Two works written after Gregory of Tours, added details which are mostly not considered reliable, but which may contain some facts derived from other sources. These are the Liber Historiae Francorum and the Chronicle of Fredegar. It is the first of these which specifies that Chlodio first pushed west through Roman-inhabited territories of the Silva Carbonaria, a region running roughly from Brussels to the Sambre, and took the city of Tournai, before moving south to Cambrai. Concerning Chlodio's ancestry, the non-contemporary Liber Historiae Francorum says his father was Pharamond, a Frankish King only known from such later records, but reputedly the son of the real Frankish King who fought the Romans, Marcomer. The Chronicle of Fredegar makes Chlodio son of Theudemeres, another real Frankish king who Gregory reported to have been executed with his mother by the Romans. In both cases, legendary pedigrees were attached to people known from real Roman history, and so the pedigrees are considered unreliable. In about 428 AD, a marriage party of the Franks of Chlodio was attacked and defeated at a village named Vicus Helena in Artois by Flavius Aëtius, the commander of the Roman army in Gaul. This is known because the future emperor Majorian was present, and this incident was therefore celebrated in the panegyric written by Sidonius Apollinaris for him. The passage describes "Cloio" as having overrun the land of the Atrebates (Artois, a province north of the Somme, and partly between Tournai and Cambrai). A contemporary Roman historian, Priscus writes of having witnessed in Rome, a "lad without down on his cheeks as yet and with fair hair so long that it poured down his shoulders, Aetius had made him his adopted son". Priscus writes that the excuse Attila used for waging war on the Franks was the death of their king and the disagreement of his children over the succession, the elder being allied with Attila and the younger with Aetius. It has been speculated that this Frankish succession dispute may involve the family of Chlodio and Merovech. On the other hand, it has also been concluded that the Franks in this story must be Rhineland Franks, with whom Aëtius had various interactions. ^ Wood, Ian (23 June 2014). The Merovingian Kingdoms 450 - 751. Routledge. pp. 37–. ISBN 978-1-317-87116-3. ^ MacDowall, Simon (20 September 2015). Catalaunian Fields AD 451: Rome's Last Great Battle. Bloomsbury Publishing. pp. 23–. ISBN 978-1-4728-0744-1. Gregory of Tours, Historia Francorum. 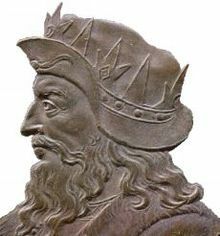 Pharamond or Faramund is a legendary early king of the Franks, first referred to in the anonymous 8th-century Carolingian text Liber Historiae Francorum, also known as the Gesta regnum Francorum. In this work, which is customarily dated to 727, the anonymous author begins by writing of a mythical Trojan origin for the Franks. The emphasis of the Liber was upon "construct[ing] a specific past for a particular group of people." Silva Carbonaria, the "charcoal forest", was the dense old-growth forest of beech and oak that formed a natural boundary during the Late Iron Age through Roman times into the Early Middle Ages across what is now western Wallonia. The Silva Carbonaria was a vast forest that stretched from the rivers Zenne and the Dijle in the north to the Sambre in the south. Its northern outliers reached the then marshy site of modern Brussels.